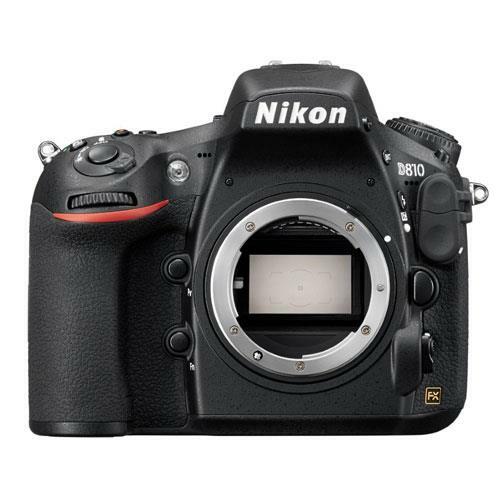 The Nikon D810 is a professional level full-frame DSLR, made from a tough metal frame with weather-sealing, delivering stunning image quality virtually everywhere you might want to take pictures. Featuring a high-resolution 36.3-megapixel FX sensor, with no Optical Low-Pass filter, the D810 is capable of capturing detailed images with a wide dynamic range whether you’re interested in landscape photography, wildlife photography, portraits, products or action. The D810 can be used to produce high-resolution stills even in challenging lighting conditions, thanks to its native ISO sensitivity range of ISO 64-12,800 (expandable to 51,200). The D810 uses Nikon’s 51-point intelligent multi-CAM 3500FX AF system to achieve sharp focus results in conditions as dim as -2EV in the centre. Fifteen cross-type AF points inhabit the centre of the sensor and they’re compatible with AF NIKKOR lenses with open apertures of f/5.6 or faster, while 11 of those points work with f/8 lenses. Focus can be checked quickly by zooming in up to 46x on the camera’s large 3.2-inch 1229k-dot RGBW LCD offers a crisp display for composing images, with an anti-reflective coating for optimal visibility in all conditions. The D810’s flexible AF capability can be grouped to suit the scenario and with the camera’s EXPEED 4 processor, the D810 can produce cleaner pictures in low light and buffer full-resolution stills at 5fps (7fps when shooting in cropped DX mode). Additionally, the D810 records media to two card slots, one compatible with CF cards and the other with SD cards. This is a tough, workhorse DSLR camera that photographers can use in a variety of environments and conditions due to the fact that it has a rugged magnesium-alloy frame and weather-sealing. Nikon D810 owners can connect take advantage of wireless Lan and Ethernet for high speed file transfer and remote control. To connect, users may purchase the optional UT-1 Data Transmitter along with the WT-5A Wireless Transmitter. Compatible with a vast family of Nikkor lenses, the D810 offers broadcast-quality Full HD video in FX and DX formats at up to 60fps. Users also have the ability to connect an external recorder via clean HDMI out for uncompressed 1080p video and there’s an external stereo microphone input for professional quality audio.